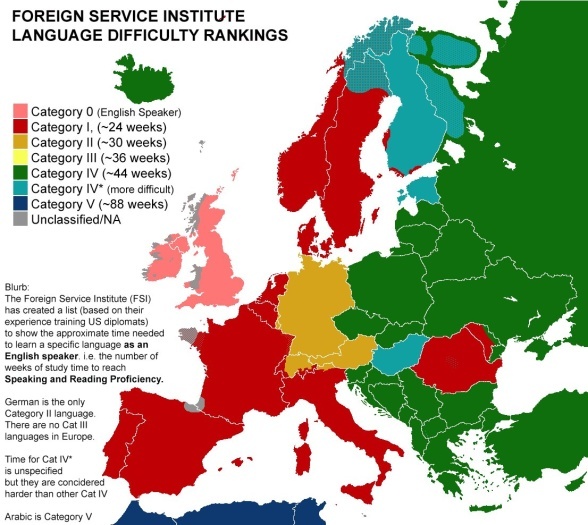 I found a fun map on twitter, from the Foreign Service Institute (see below), which categorises the difficulty of learning a language identified as number of weeks. According to the map (which applies to (American) English speakers), Swedish and French are languages that are supposed to be very easy to learn, whereas, e.g., Russian is found among the more difficult languages. 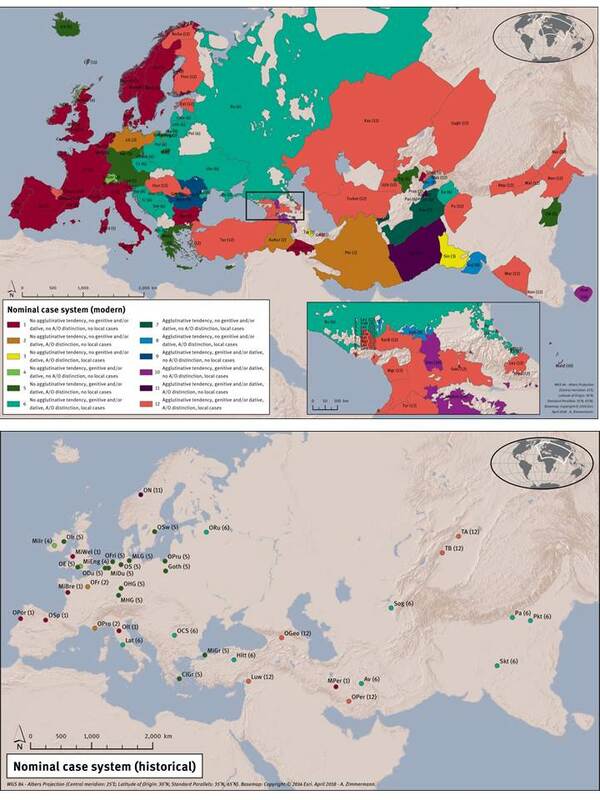 Even though applied to English speakers, the map would not be very different to a speaker of Swedish or German. Why is that so? If you ask normal people (i.e., without a degree in linguistics), the answer would naturally be that languages like English and Swedish “have no grammar”. If you ask what they mean by “grammar”, many would come up with the answer “they have no cases”. In learning a language like Russian, we have, early on, to start learning many case forms, and then to learn the rules for how to apply them in language. This is difficult to most of us using a language with prepositions (in, on, on top of, towards) rather than cases. But why do some languages have cases instead of prepositions? Or, to reverse the question, why do some languages have prepositions instead of cases? And are really the usages of prepositions easier to learn than the usages of cases? Very few languages (such as Hungarian or Ossetian or other exotic languages in the Caucasian mountains) have as many cases as any normal language such as Swedish or English has prepositions. The rules of English prepositions are also hard to learn, and speakers of, e.g., Swedish often make mistakes in the use of prepositions. However, if we take a look at the map of learning difficulties in contrast to the map of case system types below (data from the DiACL database), the correspondence between the two maps (in the parts that overlap) is striking. Analytical systems are the easiest, followed by fusional, and finally by agglutinating and other more complex systems. It would be very interesting to see what the map looks like to native speakers of Finnish or Russian. fusional, where paradigms are built by cases which may mark several functions, such as feminine + dative + plural. Case systems are typically of one of these types, where isolating systems are small, with 0-2 distinctions (e.g., English, Swedish, Danish), fusional systems are medium-large (e.g., Russian, German), often with many different forms in the language, whereas agglutinating systems tend to be large (e.g., Finnish, Hungarian, Turkic). Agglutinating systems are ruled by the principle, one suffix – one function (e.g., plural, dative). Systems are seldom ‘pure’: most languages have case systems that are partly isolating, partly, agglutinating, partly fusional. That is what makes them difficult to learn. Why is the case situation the way it is? The structure of case systems has multiple explanations, and linguists are not yet aware of all the details in the process and development of case systems. 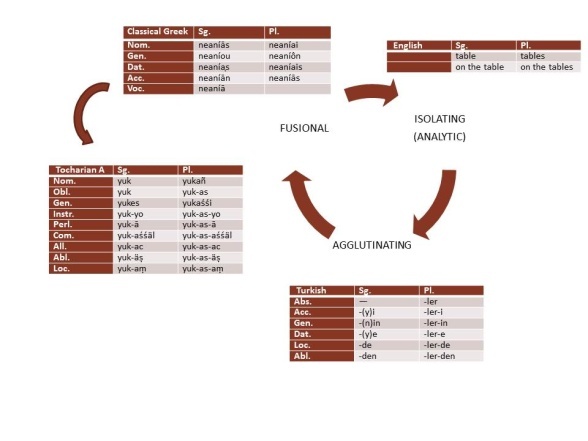 One important reason for the outcome is language change and the cyclical behaviour of case systems: Fusional systems (e.g., Russian) tend to break down or erode to isolating systems (e.g., English), which in may merge their combinations of noun + adposition into an agglutinating system (e.g., Turkish). And agglutinating systems, again, may fuse their forms to become fusional. However, in this cycle, languages may become stuck for millennia between states, where various types of mixed, weird and complex systems, with many and irregular forms, become standard. Besides time and cyclic change, geography and language contact shape case systems. The situation is complex: case systems show clear tendencies of sharing similarities over language, branch and family boundaries. For instance, no case is more frequent in Western Europe, fusional cases are more frequent in Eastern Europe and in various conservative pockets (islands, forests) such as in Iceland, Faroe Islands, Germany, and Dalecarlia, and agglutinating cases are more frequent on the Asian landmass (except for in the east, China). 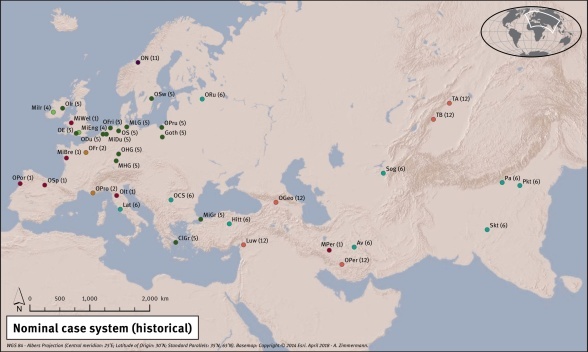 But the map is complex: historical explanations struggle with geographic explanations, which in turn struggle with typological cyclic behaviour explanations, when we try to explain the structure of case systems. Distribution of types of nominal case systems in modern (top) and ancient (bottom) languages. Dark red (1) targets no cases, green represent fusional types, pink/purple nuances agglutinating systems. Illustration of the morphological cycle of case systems. Tocharian is an example of a mixed system which has moved in the opposite direction, from fusinal to agglutinating..
<a href="https://www.academia.edu/28783633/Revisiting_the_anasynthetic_spiral">Doubts</a> about "the morphological cycle of case systems".